Our free business growth tools help you succeed, grow, and thrive. 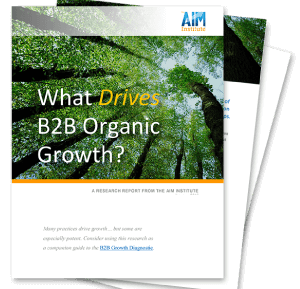 The AIM Institute is committed to helping B2B companies achieve rapid, profitable and sustainable organic growth through market-leading products. That’s why we’ve developed growth tools you can apply whenever you want, at no cost or obligation. 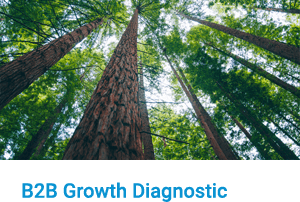 This powerful business diagnostic tool examines 24 growth drivers to deliver an unbiased, frank appraisal of your company’s growth capabilities and potential. Your customized 20-page diagnostic report provides a clear-eyed assessment of how you compare to peers and what you must do to surpass them. Repeat this annually to create an organic growth roadmap you can count on. Optimize your marketing efforts by using this tool to analyze each of your target market segments. Download a 16-page market-specific report loaded with customized recommendations for 8 early-stage marketing tasks (understanding needs) and 7 late-stage marketing tasks (promoting solutions). This is the home of the B2B Index–the metric developed by The AIM Institute to reveal “how B2B” each of your markets is. Our FutureScenes®; Trend Sheets enable your busy employees to see what’s coming in this fast-changing world. From artificial intelligence (AI) and autonomous vehicles to the internet of things and urbanization, these trend sheets will spark better strategy, ideation, and product development. Each sheet includes broad implications for businesses and encourages your team to consider specific implications and ideas for your business.